More people are getting a glimpse of the beauty and comfort of solar shades thanks to our new vans hitting the road. 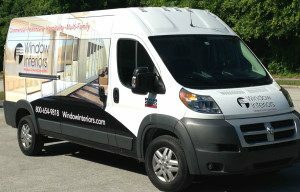 Window Interiors have wrapped two vans and will be updating the older vehicles this year. 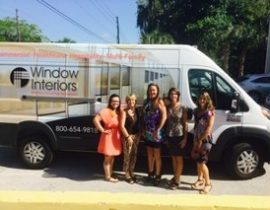 The vans will travel to job sites across Florida and around the Southeast. They will be seen outside while crews work at the new Dr. Phillips Performing Arts Center in downtown Orlando, luxury apartments in Tampa, and other commercial projects across the region. The vans feature an image of the monumental solar shades installed at Florida Hospital Orlando along with shades for other commercial buildings. Our business has spread by word of the mouth thanks to the support of architects, contractors, and property managers for the last 25 years. With our new fleet wraps we will continue to spread the news about solar shades while we are on the road! Technosigns of Oviedo did a great job for us!